Next Actions and the ability to order your tasks are an integral part of any system that implements the principles of Getting Things Done®. 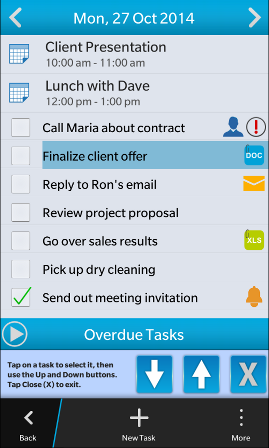 Tasks marked as next actions (select Mark Next Action from the context menu) appear at the top of any task list and can also be found in the Next Actions view. You can also re-order the tasks in any project, context, day as well as in the Email Tasks, Contact Tasks, Next Actions and In-Basket views to reflect the order or priority of the tasks within that project, context, day or view. Simply select Reorder Tasks from the context menu. Tasks marked as Next Actions signify important tasks that need attention first. They always appear at the top of any task list (unless they are marked as completed). 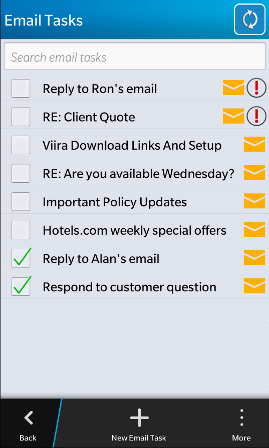 Using Viira's Reorder Tasks feature you can re-order the tasks in any project, context, day or task-based view to reflect the priority of that task within that particular project, context, day or view.